Ernie Regehr is Research Fellow at the Institute of Peace and Conflict Studies, Conrad Grebel University College, the University of Waterloo, and a Fellow of The Simons Foundation of Vancouver. He is co-founder of Project Ploughshares. Here, he sits down with Project Ploughshares to talk about the founding of the organization. Can you tell us a little bit about your background? Education; early career; aspirations? My university career was confined to a BA in English literature – perhaps not immediately relevant to the issues addressed through Project Ploughshares, but with studies that included lots of Joseph Conrad, meaning of course Heart of Darkness and Nostromo. Literature turned out to be a pretty good introduction to social/political conflict. My first post-university work was in journalism (some general reporting in Kitchener-Waterloo, editorial writing in Peterborough and freelance work in Ottawa) and then work for a member of Parliament in Ottawa – during which time I also wrote a short book on Canada’s arms industry and exports (Making a Killing, McClelland and Stewart). An emerging interest in Africa led [former Ploughshares Associate Executive Director] Nancy [Regehr] and me to head to southern Africa for a two-and-half-year assignment with Mennonite Central Committee, in 1974-76. The focus was still reporting – the assignment being to report to the Mennonite Central Committee’s North American constituency on the role of the churches in both supporting and resisting apartheid in South Africa (which led to Perceptions of Apartheid, Between the Lines). What was the emotional impetus behind starting Project Ploughshares? What drove you to act, as it were? Much of our time in Africa was spent in Zambia and Botswana. (After about five months in South Africa our residence/visitors permit was revoked, and Zambia was then the host country for a range of southern African liberation movements, including the ANC of South Africa.) As newly independent countries, Zambia and Botswana were determined, as were other newly independent states in Africa, to assemble modern armed forces, with jet fighters, tanks and all the rest of the military paraphernalia that was assumed to be essential to modern security forces – all supplied by the arms factories of the North. At the same time, it was obvious that the long-term viability of those states would depend on their capacity to provide for the human security of their citizens – education, health care and the economic wherewithal to meet daily needs of food and shelter. Tanks and jet fighters were not going to deliver human security, in fact they were an obvious impediment to reaching such goals. When we returned to Canada, Nancy and I retained our interest in the issues framed through the African experience and I explored the possibility of doing some research and writing on the theme of militarism and underdevelopment – notably, the role of the international arms trade with the third world as an impediment to social and economic development. What direction was your career/life going in at the time when you decided to start Ploughshares? Was this a big U-turn or a natural direction in which to go? In 1976, the efforts that led to Project Ploughshares were a logical extension of my interests and recent work and experience, and the big challenge was to find the means to continue it. And that led to a meeting with Murray Thomson – whose interest in all of these issues was far advanced through a wealth of domestic and international experience in community organizing, development work and action against militarism. Had you met Murray before? Did you collaborate on any projects before Ploughshares? Murray and I hadn’t met before that point, but he was then Executive Director of CUSO and had also written a favorable review of Making a Killing, so he was a logical person for me to seek out. Murray responded with a wealth of ideas for taking the work forward and also provided some seed money from CUSO. That led to the initial militarism and underdevelopment research project and to a series of meetings with others interested in the work and, after a few months, the christening of “Project Ploughshares” as a 6-month project. Why did you feel you could not take your cause to an existing organization? What is it about Ploughshares’ work and mandate (as you envisioned it then in the beginning) that made it unique? It didn’t take very long for us to have the sense that this basic theme of militarism and underdevelopment would require its own institutional vehicle. There were existing institutions that were certainly sympathetic to the “cause” (for example, besides CUSO, the Mennonite Central Committee, the Canadian Friends Service Committee, the Development Education Centre and Conrad Grebel University College), but all had much broader mandates, and none had the resources that could sustain such a project, even though each provided support – either directly through funds or through in-kind support. Conrad Grebel College offered office space and a much-valued affiliation with its emerging peace and conflicts studies program. At the same time, the ecumenical community was very active in a broad range of peace and justice issues through a variety of “inter-church coalitions” (with programs on a diverse range of issues from anti-apartheid efforts, to human rights in Latin America and elsewhere, to corporate social responsibility and other themes). They thus also offered an organizing model and led us to connect with The Canadian Council of Churches as the institutional home for our project. What did you envision then (at the beginning) and how does it measure against what Ploughshares is now? For my part, the whole enterprise seemed sufficiently fragile to preclude any grand vision of what the future of our work might be. All the funding was short-term (through Murray’s efforts, some early CIDA grants became available to promise a bit more stability and to permit Murray to come formally on board as a staff person focused on education and government relations in Ottawa). The churches were also providing some funding – notably the United Church. We regarded the issues as critically important and felt that Canadian policy-makers in particular needed to be challenged with the realities of the devastating impact of the international arms trade – Canada not being a central supplier, but still a significant participant in the international arms trade. So the objective at the time, as I recall it now, was simply to do the work as long as we could afford to do it (assuming that when the funds ran out we would get real jobs and find other means of livelihood, and other ways of continuing to press these issues). When and how did you get financing initially? When did you start taking on other staff members? The financing, as already noted, wasn’t particularly systematic and certainly wasn’t very secure at the outset – but we kept scraping it together. Murray was the one with extensive contacts and a proven record in political/social change efforts and was central to attracting funds. Some of the churches came on board and that provided basic core support. Independent fundraising changed significantly in the climate of heightened attention to nuclear fears in the latter 1970s and early 1980s. While we had not begun our work with a focus on nuclear issues, we nevertheless understood the nuclear arms race to be an extreme manifestation of the militarism that perversely sought security through an ever-expanding capacity for destruction. So our work responded to the heightened nuclear fears. That climate of public apprehension meant many Canadians were prepared to support nuclear disarmament advocacy – through direct participation in public education and events and through financial support to organizations leading on the issue. A number of new organizations emerged during that time and they, along with Project Ploughshares, were engaged in public education and advocacy and drawing on public support. Nancy had been involved in a volunteer capacity and gave a major push to direct mail fundraising efforts to support the work. In the meantime, Kathleen Wallace-Deering was hired and based in Vancouver, from where she focused on public engagement. There was also an Administrative Assistant by then. 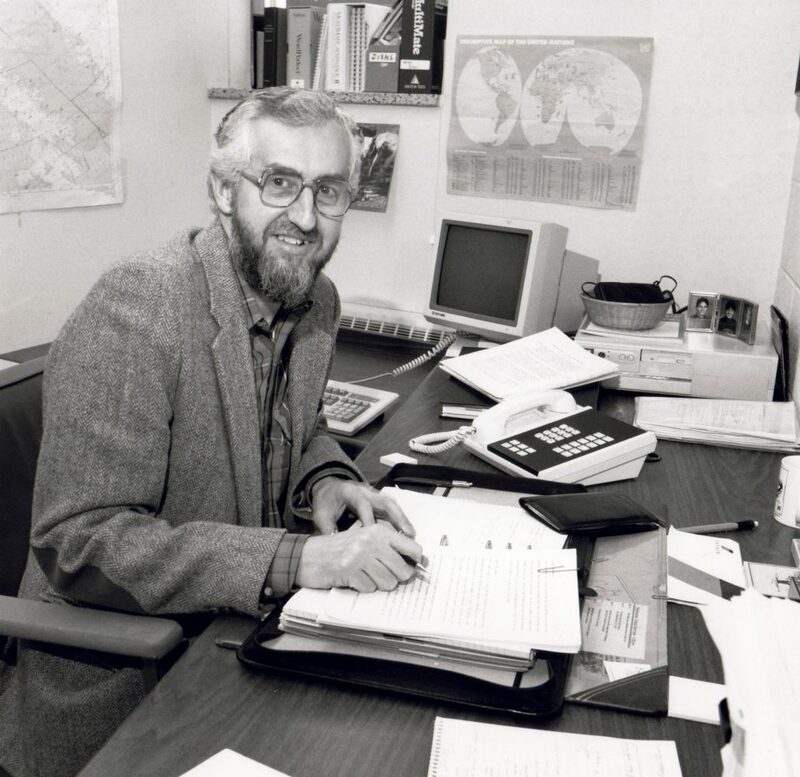 In the mid-1980s when the public fundraising increased we expanded – and that is when Ken Epps came on as a researcher. Can you explain a little bit how Ploughshares has evolved or changed over the years? As noted, we engaged the nuclear disarmament issues in the latter 1970s during the lead-up to the First United Nations Special Session on disarmament in 1978 – that also being the time when Ronald Reagan launched his presidential election campaign and began to call for expanding nuclear weapons arsenals. When the public nuclear fears subsided after the end of the Cold War a dozen years later, many of the organizations that had built up around the nuclear issues declined and ceased to operate, however Ploughshares actually experienced a spurt of growth. We continued to track and highlight the nuclear issues, we reinvigorated the work on the arms trade, and we broadened the work to include conflict and peacebuilding issues. Another significant change was in the direction of collaboration and co-operation with international civil society and through engagement at the UN. Obviously, there was an element of that from the outset, but it had become clear that a focus on Canadian policy was not enough – there had to be international solutions to the challenges of militarism. The work on the arms trade was a particular case in point. Canadian military export policy was and is important, but, obviously, to make a dent on the international arms trade there would have to be global and systemic change – and that led to a particularly active and fruitful involvement with international civil society working on arms trade issues. The work of Ken Epps was particularly important in tracking Canadian military production and sales. Our efforts to promote transparency resulted in my appointment as the Canadian representative on the UN Group of Governmental Experts on arms transfer transparency – which led eventually to the Conventional Arms Register. As already noted, the “nuclear scare” of the late 1970s and the 1980s was one such political moment that shaped the direction of Ploughshares’ work. Another critically important moment came in the form of the Ethiopian famine of the 1980s and the long and devastating Ethiopian War (seeking Eritrean independence and the overthrow of the Mengistu regime). At the urging of the Mennonite Central Committee, Ploughshares and the Institute of Peace and Conflict Studies at Conrad Grebel College joined to host discussions amongst diaspora Ethiopians, resident in Canada, the U.S., and Europe, on issues related to the Ethiopian war and the search for peace. That led to collaboration with the Life and Peace Institute of Sweden, to attention to the war in Somalia and engagement with Somali Canadians, and ultimately began a long-term collaboration with the Africa Peace Forum (APFO) of Nairobi. That work was a manifestation of Ploughshares’ peacebuilding programming – which came to involve, always in collaboration with APFO, Track II diplomacy on Sudan and work on small arms issues in the region, including the Nairobi Declaration on small arms. More recently, the war in Afghanistan has included attention to the need for diplomacy and negotiations to end the war. What are your proudest achievements through Ploughshares? Perhaps the key achievement is that Project Ploughshares, 35 years later, continues as a dynamic advocate for demilitarization, arms control and disarmament, and the pursuit of conditions conducive to sustainable peace with justice. One achievement is the durability of Ploughshares – in the sense that it has been unique for a peace and disarmament NGO in Canada to develop a solid base and become institutionally stable. The more important achievement has been that, through the collective effort that Ploughshares has always been, there has been a persistent voice in support of demilitarization, disarmament and building conditions for durable peace. The sustainability of Project Ploughshares depended on its institutionalization and the development of durable funding and professional working conditions. In the process there have been some milestone events. Ploughshares hosted the international civil society conference that launched the still active International Action Network on Small Arms. We were participants in the early days of the landmines campaign. I’ve already mentioned the UN Conventional Arms Register. We helped draft the Nairobi Declaration which was a major factor in building consensus around the UN Program of Action on small arms. Our support for civil society work on an Arms Trade Treaty meant we participated in creating the conditions that ultimately led to current negotiations on such a treaty. We were important participants in building the global climate that now supports the pursuit of a world without nuclear weapons. A particularly important achievement was the transformation of modest research and action program of a couple of people into a professionally managed institution that is now well-placed to continue to witness to the objectives of nuclear disarmament, control of the arms trade, major constraints on the resort to force and the creation of conditions conducive to sustainable peace. What do you hope for its future? When did you leave Ploughshares? Why did you leave? And what are you doing now? I left Ploughshares largely due to the inexorable passage of time – not due to any diminishment in interest in the issues that have animated the work of Project Ploughshares since 1976. My current work continues to engage the issues that Ploughshares engages. To read Ernie Regehr’s weekly column, visit DisarmingConflict.ca.